Super lovely owner-couple makes you really feel as a part of the family. 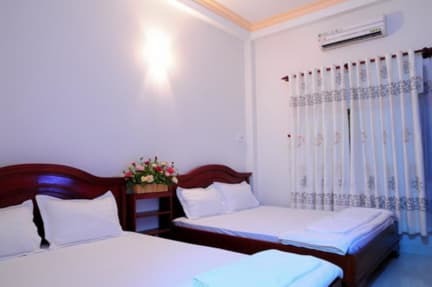 Hostel is in a lively small street, but inside you don‘t hear any of Saigons noise. Rooms are clean and the owners help you with the tours. I would definetely stay there again! Loving this place! Stayed here 4 years ago and again this year. Very awesome place to stay directly at the centre and backpacking area. Anh and his wife were such a lovely host and helped where they could! I came here for the second time. It did not cange and the hostel Family was as great as before! Anh and his wife gave us the feeling of being part of the family. Organizing trips to Cu Chi Tunnels & the Mekong Delta was easy, for a good price including pickup service. Anh gave us tons of tips, what was to see in HCMC on foot like the war museum, which made the stay very interesting. Also his recommendation to go to the Pho Place „Pho Quynh“ was perfect. Best Pho soup of our lives: Special recommendation „Pho Bo Tiền“ (Special Meat Balls) =) Would come back anytime! this staff is the nicest person ever! he really cares about everyone and makes everything possible for you, whatever you ask for. the rooms are clean and you'll find everything you need. it's located directly in the backpacker area, but in an little alley so it's quite at night. we loved to stay here and will be back for sure! This place is so nice and cute. The guesthouse runs by a really nice older couple. They are so helpful and try to give us the best stay. Would come again. Very friendly and helpful staff, but the wifi was kind of weak. We enjoyed our stay there though! 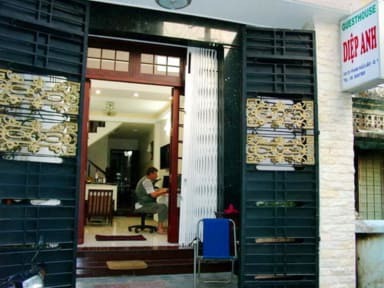 Sehr gutes Guesthouse für ein paar Tage hcmc! Sehr nettes Besitzerpaar, die gerne bei allem helfen. Lage direkt an der Partymeile, aber in ruhiger Seitengasse. Nur die Tagesausflüge sind nicht unbedingt zu empfehlen. Kein Aufenthaltsraum, Zimmer sauber und groß.